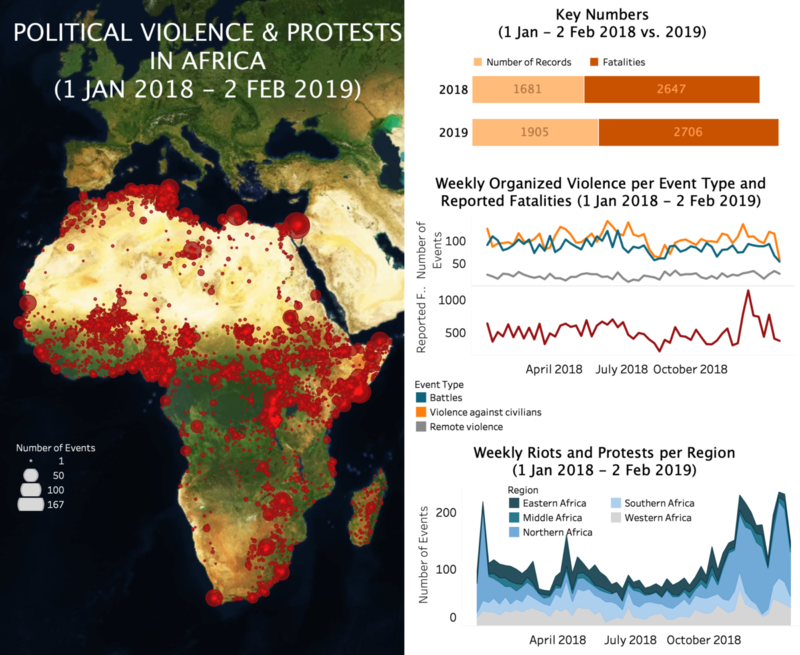 Key developments in Africa in the week of January 27th include the militant violence in Burkina Faso, the rising instability in Nigeria ahead of the February elections, and the political tensions in Cameroon, Burundi and Western Africa. Jihadism in the Sahel remains a potent source of insecurity as it continues to expand in frequency and geographical spread. In a troubling show of force last week, militants overran several military bases and carried out large attacks against civilians in both Burkina Faso and Nigeria. In Burkina Faso, militants of the Group for Support of Islam and Muslims (JNIM) overran two army bases in Nassoumbo in Soum (Sahel region) on January 28th and in Kompiembiga in Kompienga (Est) on January 30th. The attack in Nassoumbo triggered the deployment of French force aircrafts and commandos to repel the militants – only the fourth reported such deployments since the boosting of France’s presence in Burkina Faso in late 2018 to tackle the JNIM expansion alongside the government. Militants also targeted civilians on a large scale last week: they attacked the villages of Sikire and Boukouma in Soum (Sahel), leaving 10 civilians killed; ambushed aid vehicles on two occasions in the Bam area (Centre-Nord), abducting at least six people; and targeted teachers, pupils or property in schools in the Nord, Sahel and Est regions. A woman was also beheaded in Midebdo (Sud-Ouest), raising further fears of an expansion of the insurgency southwards. Meanwhile, Boko Haram continues to destabilise communities around the Lake Chad basin. The approaching of the February 16th general elections in Nigeria is providing a tempting opportunity for the insurgents to debunk president Buhari’s claim in December 2015 that they had been “technically defeated”. On January 28th, a day after the Nigerian troops withdrew from Rann (Borno state), Boko Haram carried out its deadliest single attack on civilians since that in Dalori village on January 30th, 2016. This came nearly two weeks after the Nigerian troops regained the town from the IS-led Barnawi Boko Haram faction, which only captured it for a day. Despite the overlapping areas of operations, tensions between the two Boko Haram factions (Shekau vs. Barnawi) are seemingly simmering around the Lake Chad basin, with rare incursions reported recently by the Shekau faction into Niger, targeting Barnawi supporters. In Nigeria, further layers of insecurity are affecting the electoral climate. Resistance to the government’s military campaign against “bandits” in the Zamfara and Katsina states continues: at least 13 civilians were abducted by gunmen in Zurmi (Zamfara) on January 28th amidst renewed large-scale air raids in the area. Protests also erupted in Lagos, Abuja and Port Harcourt last week after president Buhari’s suspension of Chief Justice Onnoghen. Some have denounced the move as an attempted coup against the Nigerian judiciary, which would rule on any dispute arising out of the presidential election. Lastly, violence rose against politicians and party supporters last week: the All Progressives Congress (APC) Chairman of Adamawa state was abducted on January 30th, while gunmen fired at civilians attending an APC rally in Sagbama (Bayelsa) on February 2nd; on January 31st, gunmen targeted a Peoples Democratic Party (PDP) convoy; and lastly, protests were held by members of the Indigenous Peoples of Biafra (IPOB) against the elections. Other developments last week highlighted the repressive environments in Cameroon, Burundi, and the political instability in a number of countries in Western Africa. In Cameroon, the newly re-elected president Biya’s violent response to the large protests held in support of his opponent from the Movement for Renewal of Cameroon (MRC), Kamto, on January 26th, showed Biya’s continued grip on power. Police and Rapid Intervention Battalion personnel dispersed the protests, using live ammunition in one instance, and arrested over 200 people during and after the protests, including Kamto himself and other MRC leaders. A journalist was also stabbed in Yaounde for reporting on the protests. Similarly, in Burundi, the space for political opposition remains tightly controlled by the government. Assaults and attacks by the pro-government Imbonerakure youth against civilians or against alleged supporters of the opposition National Forces of Liberation (FLN) or the Movement for Solidarity and Democracy (MSD) continue to occur on a daily basis. Lastly, in Western Africa, political instability rises as control seems increasingly exercised through militias. In Ghana, violence by suspected pro-government gangs against members of the National Democratic Congress (NDC) unexpectedly erupted during a parliamentary by-election in the Ayawaso West Wuogon Constituency in Accra on January 31st. In Liberia’s Monrovia, gunmen destroyed the property of a radio station after its journalists allegedly criticised President Weah. And in Sierra Leone, two factions of the ruling Sierra Leone Peoples Party (SLPP) in Kailahun (Eastern province) generated violence during President Maada Bio’s visit to the district.